A quick guide on how to import from Excel. You might wish to upload an Excel spreadsheet in Plecto with e.g. monthly targets or manual sales entries. This quick guide will show you how to do it in a few steps. Import from Excel only works with 'Custom Input' (manual data entry) data sources. To download our Excel template, you'll need to create a custom input data source. You do this in 'Data sources' > '+ New data source' > Choose 'Custom input' > Add fields e.g. 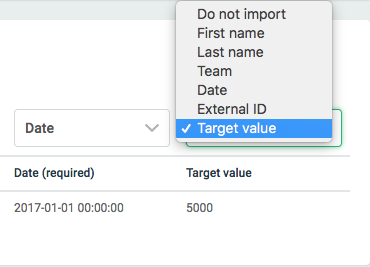 'Target' (if you wish to create a target data source) > Click 'Save'. Once your data source is created, you can download our Excel template. Each line in the file must represent a unique registration. Please make sure you fill out all the required fields. Each line must provide some information about the employee, so we can figure out which person you are referring to. an External User ID and External System Name that will be used to uniquely identify the employee (External User ID can be a phone number or a random string of numbers - it just has to be unique). NB. If you want to fill out the e-mail please be aware that we match your Plecto users on the e-mail address, so please use the same as on creation. Otherwise we'll create new users. If you write different first- and last names than we have registered we will update with the names from the spreadsheet. Date: A valid date and time for the registration. Make sure to format the date correctly. Date format needs to be YYYY/MM/DD. You can leave the External ID row empty, and we will auto fill it when importing. The External ID is a smart and easy way to later update your data. Keep the same external ID, and just upload your spreadsheet again, and we will update if any new information. When the spreadsheet is filled out, simply upload it in the 'Import from Excel' page. Remember to choose the data source you want to import the excel data into. How to create a manual data source.